Straight Arm Frog Stands (high hips) - starting properly now. Tuck planche with low hips wasn't efficient. I have all year to build myself up properly anyway. Freestanding Handstand - 5s! Let my feet off the wall, not as impressive as just doing it in the open. HeSPU Negatives (shoulder width) - 3x3. Feeling much stronger. I can resist the negative and hold a static with my head off 1cm off the ground now. Wide HeSPUs - 3 reps as a test. It felt easy! All from doing shoulder width negatives! These wide ones MAY carry over to human flag, due to the similar straight arm position, so I may do these. Although the main aim is to learn shoulder width. About 10 sets of 12 throughout the day (GTG), in between studying for this month's exams! 30 without pausing, just to test my GTG progress. Felt harder than expected actually, despite my dips improving. I remember that feeling too! That is a good feeling to have. Hopefully you won't lose it. Only be concerned if the feeling starts to disappear. I remember whenever on the bus to college, I'd be looking out the window for monkey bars on parks as I passed by, because there weren't any good ones in my village. In the end I did it on my park, but the park swing is really thick, so it wasn't optimal. Man thanks for being so kind, I really appreciate it, and I Agree with all you said It's those hidden passions and needs for activity that keep me going, since I found this Forum now I like to call it bar-barian instinct Whenever I find something cool to climb up or jump over, some cool spot, I can't resist! Or a nice big tree, I love it! Thankyou so much for posting your Great video, really good mate and Indeed, first thing I thought myself was the width of that bar, that makes it much harder! My motivation is sky-high right now (for calisthenics), so I can't be bothered with studying, but it has to be done. I've got 6 exams, but they finish on the 24th. Just thinking that once it's over, I can chill again and focus on calsithenics progress. What degree are you doing at uni? I do all my 20s holds tensing every muscles hard as possible, sitting as high as possible, legs as stiff and straight as possible (exaggerating the efforts) to condition myself better towards the 60s goal. Still feels fairly easy! Getting used to the balance is hard, but my hips are nice and high now. 20 reps not to failure. Probably could've done 22-24 but I don't like hanging between reps like that, so I cut it short. All I can say is, GTG is working like mad. Studying for exams supersetted with sets of 20 chest to floor push-ups. Nice man. But philosophy exams? I don't think I could handle all the writing Haha! Wait, so you've lived in England before? How come Italy now? Me too. The tree branch location isn't very busy, although an old lady was watching me the other day lol. The park can be busy sometimes. Last time I had to wait about 30 mins for some parents/kids to leave the park (it was full)! It's a nice bike ride there and back though. Thanks about the L-sit. It's a great exercise to do. Although 60s goal is a bit excessive. I should probably spend more time learning a harder move like the V-sit. But I want to prove to myself that 60s hold is possible on the floor. Many have said that it isn't possible, so I need to prove them (and myself) wrong!! That's the way man, I Admire you for that, always aim for the impossible, you can make it, I am sure you will if you decide to keep working on it. If you move on to the V-sit, Great anyway! Hey man have you achieved the Bar-Barians Reqs yet? =) That would be my only real objective for now I think. LOL, but when being observed by anyone (including girls) while doing pull-ups on a branch, it's hard not to look weird! Anyways, cheers man I will let you know ofcourse as soon as I try, even if an embarassing fail. First Back Lever Hold? The camera angle is inevitably bad on my staircase. Also ignore the funny noises I make. Lots of sets of 15 dips (GTG). Max efforts. I believe some of them were legitimate holds. When I go to the park I'll film it with a better angle. Half-lay - only held for 3s though. I have to be fully fresh to hold it. One Leg - 10s holds. 3-5s - After focusing hard on straight arm frog stands for a week, I decided to give the tuck planche an attempt. This time my hips were nice and high, which is where they need to be! In summer I was holding it for 10s, but hips were too low. I will strive for a longer straight arm frog stand before moving onto to tuck planche though. 7 sets of 25 throughout the day (GTG). Pretty comfortable but I felt depleted nearer the end of the day. 1 - just as a tester. Felt weaker than usual but probably because of the push-ups. 3x20s - feeling good. I plan to move it up to 3x25s either next week or mid-way through this week, depending on whether my body feels ready to move on. I'm aiming to break the 40s barrier at the end of the month. The Gymnastic Bodies book recommends pursuit of excellence at this hold. 3 reps - felt easy today. Yesterday's push-ups must've fatigued me. And actually, these were pretty close to shoulder width reps. I'm proud! 6x10s - trying to focus on the hollow body position. 50kg x 1 - my chin barely met the bar, but I guess I pulled myself up a decent distance. I've only ever tested my max weighted pull-up once before, and it was 40kg at that time. My max weighted chin-up in summer was 55kg, but may have actually decreased since then! I don't really train heavy pull-ups. The only time I did weighted pull-ups was with 3x5 with 10kg with explosiveness, but I never increased the weights. If I was to do a strength phase of weighted pulls in the future, I could possibly get close to a BW pull-up (70kg). 3x25s - moved this up from 3x20s. I felt the burn, but by no means anywhere near my max. This video is my 2nd set and my cat was tickling me, which makes it harder. This view shows my legs shaking quite a lot (never realised it was that bad). It didn't actually feel as hard as it looked! 7x15 (GTG) - this was done throughout the day. Feels pretty standard now! I may move up to sets of 20 next week. Cannot believe it. For those who knew my dips sucked badly, this is strange progress! I think my max without pausing is around 30 now. Sets of 5-10s. I kept losing balance. Trying to do them with really high hips. I think this way is much harder than the regular variation. Also felt somewhat depleted because of the dips. The fluctuation in max strength is worrying at times, but I just need to remember overall it's increasing. Really great stuff here man!, good to see you back training hard. Keep up the momentum when you go back to uni. Thanks man Yeah I just decided to work hard as of 2013. Slacking off is no longer an option in my brain! I'll be on the lookout Send me my ring MU video as well!! 7,7,8,8,9,10,12 with 2 mins rest between sets (total: 61). Last set was tough, can't lie. But on January 6th I did 6,6,7,7,8,9,11 (total: 54) with the same rest periods and that was tough as well, so progress has been made. I think I combination of GTG and following an endurance program like that is perfect for me right now. So either tomorrow or Thursday I'll do GTG sets of 12 throughout the day nice and easy. The next time I'll do another twentypullups workout etc. Yeah he was coaching me on my 5 one arm push-ups video from last April! Not much today, got an exam tomorrow. 30 Push-ups to see how it felt. Fairly easy. I want 50 without pausing to be easy. 3x25s - first set felt so easy. 38s is going to be murdered in 2 weeks time! Other 2 sets felt moderate. Rest day (exam), except L-sits of course. 4x25s - I accidentally did 28s in the last set lol. Still felt pretty easy. I will test my max next friday or saturday. I'll be aiming for 50s. Elite status! I've added V-sit to my 2013 goals, as pursuing an L-sit beyond 60s isn't sensible. I don't usually post pictures, but since switching to wide grip pull-ups (not excessively wide), I've actually started to acquire a back. I could feel them the other day when having a shower. I've always had a skinny-fat physique, especially when I wasn't active, so I think I'm starting to get out of it. I also have a fairly small frame (6" wrists, yet most people I know have 7"+). 11,12,13,14,15 (total: 65) with instinctive rest periods. Last set was a bit hard. All good though. 1 - my first ever!!! I think once I can do 3-5 I'll start putting my weight plates where my hands are, and increase the depth. 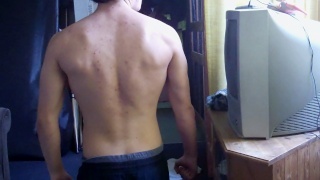 My 2013 goal is a full ROM HSPU (shoulder width). Time to attack those weak shoulders. 3s - I think I can hold it for 10s if I have to. But the problem here is that after a day of dips/push-ups (endurance), I lose my straight arm shoulder strength. I have to be fully fresh to do this. I'm still doing straight arm frog stands for the most part. They're still giving me strength gains.